No photograph can do justice to a BluebelI Wood in the spring. The drifts of blue under the trees combine with the smell of wet soil and the bird song to give a tremendous sense of well-being and new growth. 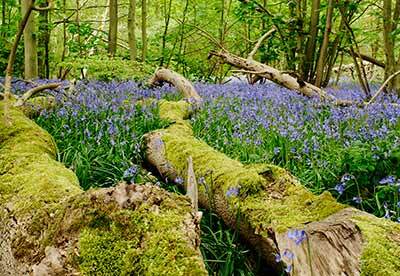 Here the Bluebells were growing amongst the limbs of storm-smashed trees which, even as they decayed, provided a home for a blanket of moss. I just wish I could have captured the amazing perfume of that evening, when the warm, still air allowed the flowers' scent to dominate.